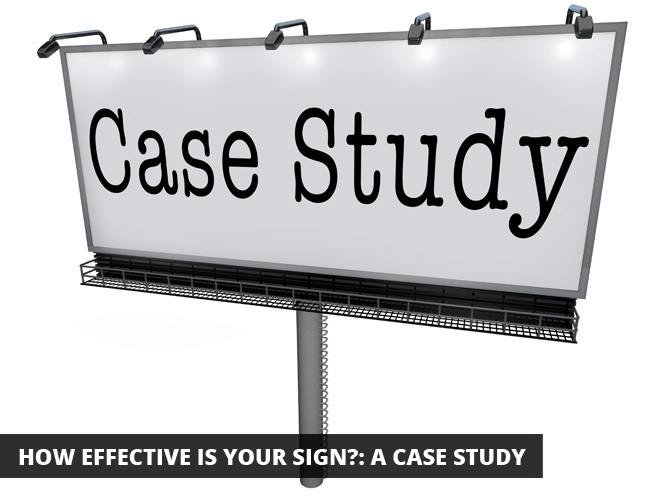 In the last two weeks we’ve gone over the theory of testing how effective your sign is, and shown how that theory can be applied to your business. Today, we will do a case study on this theory. Jeff runs a company that he built from the ground up. His company’s name is Atlas Electrical, and they specialize in electrical and telephony services for homes and businesses. Jeff is proud of his company, but he wishes that they were doing just a bit better. At the end of the year, Jeff sits down with his sales numbers, and sees that Atlas Electrical is doing very well in sales of basic electrical and telephony services packages, but has sold few full service packages. These full service packages are a bit more expensive, but they ultimately save the customer more money, as opposed to the customer buying his basic services on top of a more in-depth package from another company. Jeff decides that if he could make his customers see that they can save money by coming to Atlas for all of their electrical and telephony needs, he could boost his profits for next year. Jeff takes a look at his marketing budget and decides to go to Sign World to purchase a sign to advertise Atlas’ full service packages, focusing on the monetary benefits of going to Atlas for all a customer’s electrical and telephony needs. However, Jeff is a measured, cautious man when it comes to spending, so he needs to be sure that he is putting his marketing budget to good use. Before putting his newly designed sign up in a high traffic area, Jeff takes a look at his numbers from the previous years. He finds that in the second quarter, his sales of full service packages have been fairly low, but regular. Jeff chose to test the sign against a quarter that has consistent sales numbers to make sure that there are no other variables that could interfere with his numbers. The timing could not be better, as the first quarter is about to come to a close, and his sign is ready to go up. Jeff puts up his sign, and at the end of the second quarter, takes another look at the numbers. Over the last three years, he has sold 34, 38, and 36 full service packages, respectively. He averages out his base number that he will compare this year’s second quarter sales to be 36. At the beginning of the second quarter, Jeff puts up his sign and waits. At the end of the quarter, he goes to his books and finds that his company had sold a record 52 sales of full service packages. Jeff plugs in the numbers (52-36=16) and finds that he has increased his sales by 16 packages, a whopping 44% increase in sales! Satisfied that his sign has indeed elicited the desired behavior in his customers of buying full service packages, Jeff decides to invest more money in his marketing budget, and happily watches his sales increase, and his business flourish. Let’s go over what Jeff did in terms of the theory we talked about in our previous blog posts. He identified a specific problem in his business, the lack of full service package sales. He then came up with a targeted solution to solve that specific problem: a sign advertising the full service packages and their monetary benefits. Jeff checked the sales records from prior years, and made sure that his test period would not have any confounding variables interfering with the comparison to his base rate of sale. He also set out a test period identical in length to the period of time that he will compare his test to. With proper use of marketing methodology, and effectively designed signage, your business too can see the same success that Jeff had with Atlas Electrical.